I was first told these stories by my father when I was a child. I do not know how long they had existed before I heard them. They seem to proceed from a place of origin as old as the earth. 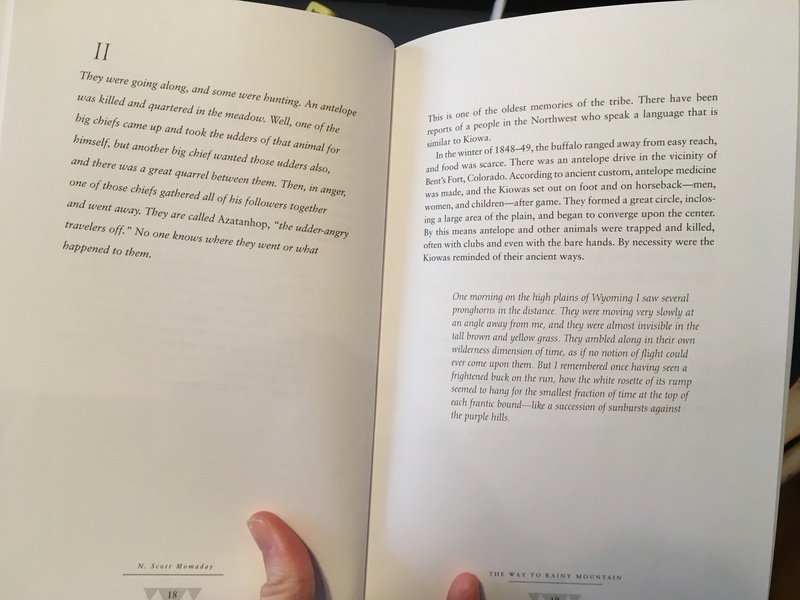 It is a spare, slim book, under 100 pages and with lots of white space as in the spread above, and with illustrations to space things out further. It is therefore just a sketching (no pun intended) of a history, and somehow this feels right, since as Momaday points out, “the golden age of the Kiowas had been short-lived, ninety or a hundred years, say, from about 1740. The culture would persist for a while in decline, until about 1875, but then it would be gone…” His ability to piece these stories together is a rare one, and the record is necessarily scanty. But the scraps that we do have here are wise and hold a certain dignity. 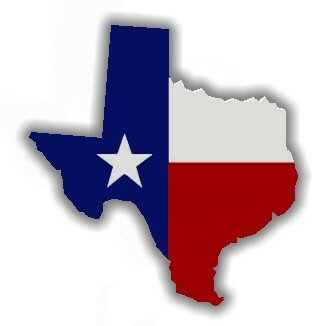 They also hold a sense of place. 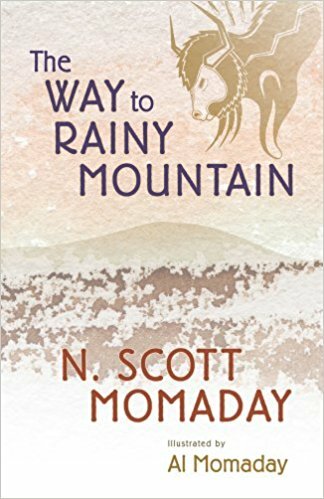 I loved lines like, “Houses are like sentinels in the plain, old keepers of the weather watch.” It somehow makes sense to me that Momaday would have so much to say about a place he feels tied to without actually inhabiting; that it’s an ancestral belonging. Once in his life a man ought to concentrate his mind upon the remembered earth, I believe. He ought to give himself up to a particular landscape in his experience, to look at it from as many angles as he can, to wonder about it, to dwell upon it. He ought to imagine that he touches it with his hands at every season and listens to the sounds that are made upon it. He ought to imagine the creatures there and all the faintest motions of the wind. He ought to recollect the glare of noon and all the colors of the dawn and dusk. I don’t remember when I got this book; I’ve had it for quite some time. (I also have Zinsser’s How to Write a Memoir waiting for me on the massive and daunting to-be-read shelf.) I finally opened Inventing the Truth to read Annie Dillard’s essay, “To Fashion a Text,” that Kim Kupperman assigned me; but I found I couldn’t put it down. I went back to the beginning and read the whole thing through, and I think it’s an excellent collection. Zinsser approaches “the age of the memoir” beginning with a series of craft talks in 1986. 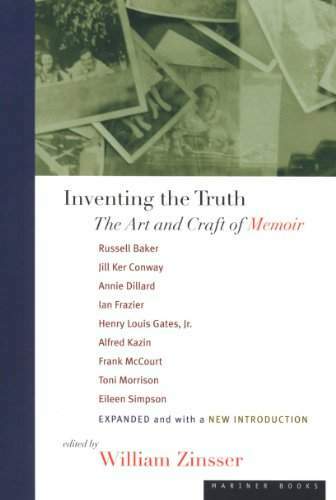 These talks, transcribed, are joined by later additions to form this collection of nine craft essays, all originally delivered orally (whether to an audience or in interview format with Zinsser) by nine writers including Dillard, Toni Morrison, Frank McCourt and Henry Louis Gates, Jr. They talk about what they want to talk about, so the subjects vary somewhat but all address how to write memoir from very different angles. Their delivery, perhaps because originally oral, is consistently enjoyable, and the content is very useful, practical, nuts-and-bolts; it also offers insights into the writing of masterpieces like Beloved. Not to be outdone, Zinsser’s introduction is a lovely piece of prose in itself, and presents a nearly perfect review of what the book in turn contains. I made a bunch of notes, and am interested in particular in reading Alfred Kazin’s A Walker in the City. A few details that especially fascinated me: that Toni Morrison considers the work of her fiction to be “trying to fill in the blanks that the slave narratives left.” And then the concept that when the straightened Mississippi River “floods” its old path, it’s not really flooding at all, but remembering: where have I heard this before? Lovely! I wonder if these essays–all of them!–struck me so nicely because they were originally delivered orally. I have always been interested in the idea of oral histories or oral storytelling. This was a deeply enjoyable book, obviously recommended for anyone struggling with the writing of memoir, but actually it should be appealing to general readers, too, especially those impressed by the work of Dillard, Morrison, et al. Perfectly pleasant reading. This retelling of the Odyssey gives Telemachus more voice than ever before. Homer’s Odyssey recounts Odysseus’s 10-year journey home from the Trojan War, to where his wife and son await him. His adventures along the way take center stage. Ithaca, Patrick Dillon’s retelling, resets that center to the son. With substantially more insight into Telemachus than readers have had before, this version also offers a more fallible Odysseus, with all the drama and yearning of the original. Dillon remains true to Homer’s setting, but the novel is told in Telemachus’s voice, and the weighty absence of a father he never met defines his existence. At 16, he worries over his role and responsibilities, and his inability to protect his mother: he has no one to teach him how to fight. These interior workings bring Odysseus’s iconic son to light as a nuanced and fully formed character. When the wise warrior Nestor assigns his daughter to be Telemachus’s traveling companion, the story gets an appealing twist: Polycaste is headstrong and capable, and her friendship has much to offer Telemachus. The gods are less present this time around; Telemachus is openly dubious. Veterans of the Trojan War roam Greece as bandits and vagabonds. Though only slight details are changed, Ithaca is a vibrant and fresh revival; Telemachus’s struggles are illuminated through the use of his own voice. The well-loved classic is present: Penelope is beautiful, determined, fading; the suitors are shocking; Menelaus and Helen fight bitterly; the aging Nestor tries to guide Telemachus true. Dillon’s achievement is in characterization while retaining the heart and passion of Homer. This review originally ran in the July 8, 2016 issue of Shelf Awareness for Readers. To subscribe, click here, and you’ll receive two issues per week of book reviews and other bookish news. This story of a missing manuscript and its darkly unhinged author has momentum and beauty. Joe Gould is best known through two profile pieces Joseph Mitchell wrote for the New Yorker. In 1942, Mitchell introduced a harmless eccentric engrossed in writing “The Oral History of Our Time”–at some nine million words, supposedly the longest unpublished work in history. In the second piece, in 1964, Gould (then deceased) is a dirty, sinister man, and Mitchell asserts that there had never been any such manuscript. Jill Lepore (a staff writer at the New Yorker and author of numerous works of nonfiction), like so many before her, was intrigued. Was there an oral history, or wasn’t there? Who was Gould, really? Joe Gould’s Teeth is a biography of Gould, a study of the record he left behind and the story of Lepore’s search. Gould was a graphomaniac; his written legacy includes letters, diaries, essays, ramblings but rather little oral history. Lepore seeks the mythical manuscript, but finds the mystery of a man. She describes herself as stumbling, falling into the “chasm” of Gould, who claimed to be “left-handed in both hands” and whose thinking was “sticky” with details. She follows him through archives and memories, and into his obsession with African-American sculptor Augusta Savage. Savage, as a secondary character, is more sympathetic (and sane), and possibly more enigmatic than Gould. Lepore’s contribution to this undeniably riveting story lies in her research, but even more in her wise, nuanced telling. Joe Gould was a genius, a madman, destitute, beloved of e.e. cummings and Ezra Pound, by turns likable and malicious. Joe Gould’s Teeth is an astonishing, wide-ranging and thoroughly enthralling work of history. This review originally ran in the May 31, 2016 issue of Shelf Awareness for Readers. To subscribe, click here, and you’ll receive two issues per week of book reviews and other bookish news. This epic retelling in verse of Homer’s Iliad is worthy of the classic. Upon his death, poet Christopher Logue left unfinished a full-length reimagining of Homer’s Iliad. His fellow poet and friend Christopher Reid applies a careful editorial hand to the papers Logue left behind to release War Music, which includes both previously published works and new material. The result is as epic and evocative, as emotional and resounding as the original, yet also surprisingly novel. Logue employs memorable images, as when the two armies meet “like a forest making its way through a forest.” He is unafraid of wild anachronisms: “As many arrows on [Hector’s] posy shield/ As microphones on politicians’ stands”; “Blood like a car-wash.” But this is no attempt to modernize; the rage of Achilles, Helen’s beauty, capricious gods and customs of battle remain set in Homer’s Greece. Rather, it is an enrichment of a well-known and loved story, in swelling verse and with the same clever eye for tragedy and sly humor of its model. Reid finds Logue’s “capacity for the grand conception dashingly and convincingly executed,” as near “pure Logue” as possible. His preface and comments in the appendix (where the manuscripts were roughest) offer insight for readers unfamiliar with Logue, who references Dostoyevsky, Shakespeare, Keats and Tennyson, as well as Homer. Expertise with the original is unnecessary to enjoy this version; although such knowledge will increase the impact, the grandeur of War Music is gripping and suspenseful regardless of the reader’s background. No fan of Homer will want to miss Logue’s contribution. Rating: 8 topaz saucers heaped with nectarine jelly. Continuing in my series of not-new-but-still-important creative nonfiction readings (see The Kiss and The Liars’ Club)… Kathleen Norris’s essay collection, Dakota, is brilliant. I see somewhat where it is dated, discussing for example economic depression and agricultural crisis – because, if anything, things are worse now. But her astute ideas and conclusions are brilliant and in many ways timeless. You saw my teaser earlier this week, so you know I am impressed. Norris, a poet, of course writes beautifully; it’s worth reading her words for their language alone. But I was really drawn in by the ideas behind them. As her subtitle notes, she is concerned with spirituality and geography. As you might have noted by now about me, I am not attracted to spiritual musings, but I was won over by the geography (in so many senses) and the sense of place which is at the heart of this collection. And I found myself on board for a certain amount of spirituality as well. …disconnecting from change does not recapture the past. It loses the future. Intermittent “Weather Reports” read like short, poetic journal entries of real, specific days, in between more formal essays. They are often not strictly reports on the weather, unless we expand our definitions of weather, which we may well be intended to do. She writes a good bit about community, how it is formed and how it can be both good and bad for itself. Norris came (back) to Dakota as an adult: her grandparents were of that place, and when she inherited their home there, she and her husband moved in. She is both from there (because the communities knew her grandparents) and not (because she grew up elsewhere, and came in as a traveled, educated, artistic outsider), which made for some interesting challenges for her and her new neighbors. Her 2001 introduction to this edition of the 1993 book discusses her adopted community’s reaction to her work, her publicization of Dakota: in a word, there was both pride and anxiety, but the fact that she stuck around eventually earned her a more thorough local membership. On the subject of community, I am intrigued by her repeated conflation of the desert, the plains, and even the ocean that once covered this region, with the monastery. 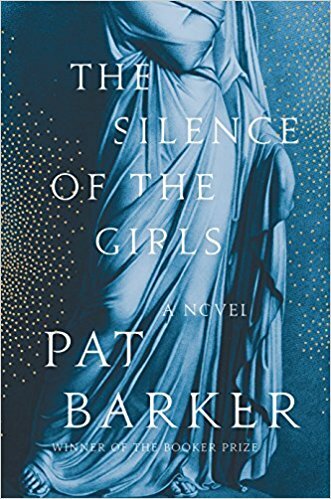 She spends quite a few pages throughout comparing the sense of quiet, of great distances increasing mutual support, and contrasting some of the ways in which these communities work. For example, I appreciated the idea (in “Where I Am” – naturally one of my favorite essays) that the monastery is different from small plains towns in that the former has a formal text or rulebook that they agree to live by: in the case of Norris’s central example, Saint Benedict’s Rule, which guides Benedictine monasteries. The small towns often find conflict because they are not all working from one central, agreed upon set of rules or values or ethics. As an artist, Norris finds that she benefits immensely from the immensity of space in the plains. And she’s got some great stories to tell about sharing art and poetry with her new communities. I find that prairie people are receptive to a broad range of contemporary poetry, although they’d be unlikely to cross town to attend a poetry reading at a college, were there a college in the vicinity. Their appreciation of the poems I’ve read aloud – from a broad spectrum of contemporary American poets – has given me a new understanding of the communal role of poets, a role poets have mostly abandoned by closeting themselves in academia. Surprises await poets who venture out into the larger community. I love this idea, that poets (and by extension, many formally educated or academic folks) have quarantined themselves with those like them, and are both failing to share what they have and – more so – failing to learn from others, by locking the doors to the ivory tower. In a strange counterpoint to this sentiment, though, I found Norris occasionally off-puttingly snobbish about the reading of books: that more prairie people should do it, that they shouldn’t consider themselves well-educated or wise without doing it. Now, don’t get me wrong: clearly I love reading books and find a great deal of value in doing so, and I think books have a lot to offer everyone and everyone should read more. But I also think that people can be very intelligent, wise, and valuable without formal reading; I think that the same prescriptions don’t work for all of us, and I think it’s a shame if she’s found (for example) a great oral storytelling tradition and then laments the lack of book reading. It makes her sound snotty in a way that the rest of the book does not. I like her better than this. I know as well as anyone that a lot of book learning doesn’t make a person wise (sometimes it simply legitimizes stupidity), but I can’t help but connect the fact that so many Dakotans have been denied access to their culture with the fact that they don’t trust that their own stories are worth much. The fact of their inhibited access to their own culture and stories is perhaps the best argument for lack of book-reading as a major problem. And she goes on to contemplate what difference it makes to a pig farmer to miss out on Plato, and what Tolstoy and the Brontes can bring to a small-town waitress. I like the nuanced discussion there. 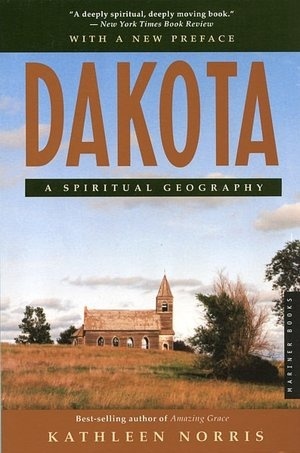 Dakota gets more and more spiritual in its subject matter as it progresses, so that I struggled more toward the end. Discussion of monastic retreats, and Norris’s relationship with the religious communities of Dakota, were often interesting to me; they are in some ways further discussion of community ideals, and I am more or less on board with the spirituality of nature, of relating to wind and sky and plant life. But occasionally there was too much God for my personal tastes. When I encounter the idea of monasteries, and other writers’ productive experiences there, I have found myself tempted sometimes to consider the same; but then I realize what I really need is to just go camping alone. I found a lot to love and a lot to continue to consider here: about place, about inheritance, about storytelling and relating to one another, about community and about definitions of spirituality. I love Norris’s writing. Although I struggled here and there, or perhaps because I did, this beautiful and thought-provoking book will stay with me and, I think, continue to guide me.